The descent was really hard. We couldn’t help sliding down into the deepest valley of the world – the valley of the river Kali Gandaki. It is considered to be the deepest because it divides two eight-thousand summits Dhaulagiri (8167 meters) and Annapurna-1 (8091 meters). By the time I and Dima reached the pass Yulia and Pasha had already been all frozen that is why they decided not to wait for us and started descending straightaway. We arranged to meet in Muktinath. We were dying for a drink, as luck would have it, there was no knock all our way. Cursing all Nepalese people for having heaps of shops on the ascent and total absent of them here, I even started to eat snow. But that wasn’t something I really wanted. We fell behind and couldn’t get on time to meet with Pasha and Yulia. I wanted a drop of cool beer and being always on my mind this fixed idea made me go down faster and faster. As a light comfort some images struck me. I was thinking of another descent while being in summer in the Tien Shan. And at that time I had to overpass much longer distance than now. I have done it once, I will do it one more time. And at the end of my way I will enjoy cool beer as well as I did before. My dream came true only in Chabarbu (a small settlement you wouldn’t find on the map), 4,290 m above the sea level. Two bottles of ‘Tuborg’ – and let’s go. The beer made itself felt at once. Tipsy and happy we were roaming along the desolate valley and singing at the top of our voices. “This is all” by DDT was the hottest hit. We had almost forgotten about Yulia and Pasha who must have been waiting for us. The scenery was fascinating and we took a lot of pictures. 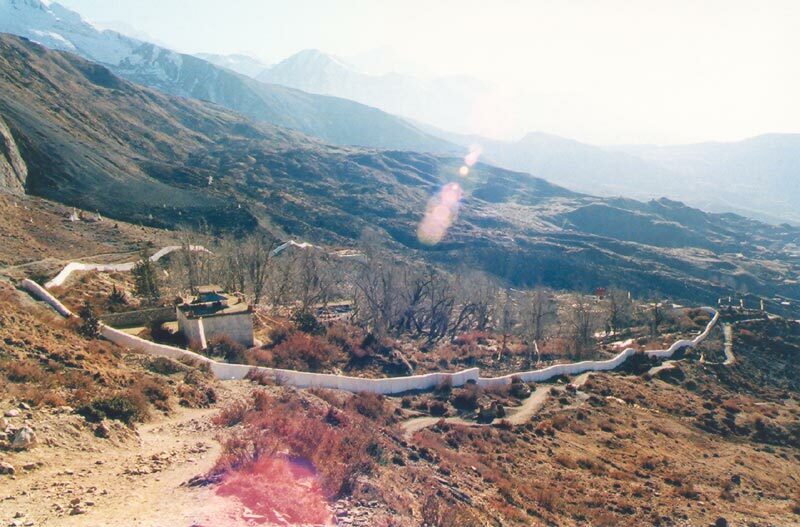 When you are descending down the pass you can always see Muktinath and the valley. It seems it is a stone’s thrown away. But this was deceiving. We had to go miles till we reached our destination. Soon we spotted the forbidden county - Mustang. Of course it is not so isolated as it used to be, but you have to pay $700 to step in this country and some extra money for taking pictures to boot. Besides you are escorted by an official all your way. And all these puts a kind of exclusive on the region while visiting it. Pasha and Yulia were waiting for us in Muktinath. We did some shopping there and then set off looking for a tent. We put up near Jharkot that looks like a cone tower, situated on a hill. While we were setting up our tent almost on the swamp, so Yulia and me got a little bit stuck in it. Then we had been working for two days along the broad valley of Kali Gandaki. The blustery wind made our faces all dusty. There was something unreal in this scenery. People and the cattle looked like grains of sand on the foreground boundless wild nature. When we entered Jomsom I though I was in Latin America. There were white fences with high arches, scraps of newspaper flying everywhere, quite unusual for Nepal anxious and barking dogs, a dusty plain and endless mountains. We wished it had been accompanied by a Morricone’s tune about Wild West. One evening when the sun went down we arrived at Marpha. And at last we managed to take a wash. Everybody was on cloud nine, especially Yulia and Dima washed in hot water. The memory of those days spent in Marpha is still clear in our minds. We could see snow-white tops of Nilgiri and a Buddhist temple from our balcony. It created such an idyllic scene. At night we heard monks beating the drums and praying. 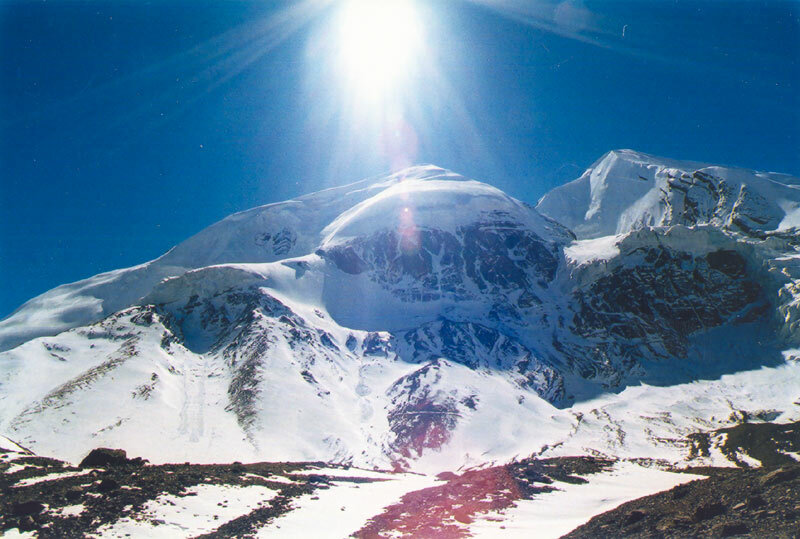 Annapurna-1 is considered the lowest one out of the fourteen eight-thousand summits. But it is very insidious and many people are putting their lives at risk when they decide to conquer its peak. 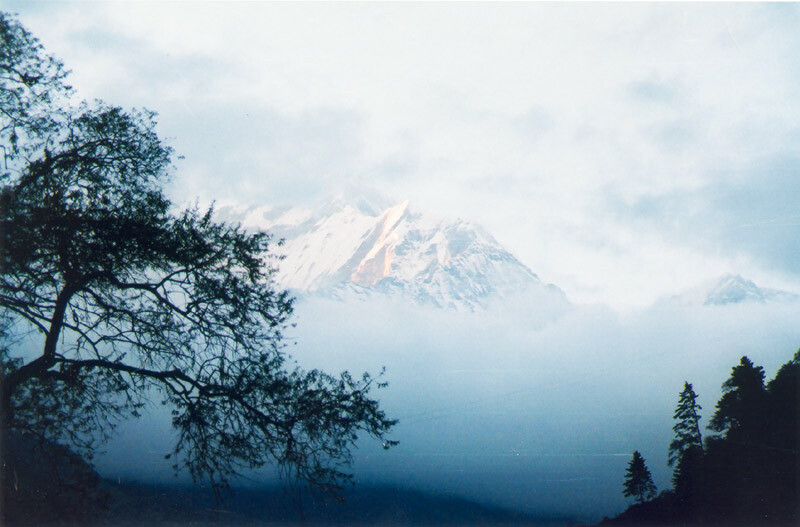 We saw Annapurna, which our trek was bending around, only at the 12 th day, having entered the zone of temperate climate. I love temperate alpine climate. That is why the territory from Kalopani to Lete I liked best. However the reason it surpassed the Alps landscape was the existence of two eight-thousand mountains Annapurna-1 and Dhaulagiri. I wondered how much the houses cost in this place and even began thinking of moving to this blessed nook. We were about to set up our tents when all of a sudden excited Dima cried out to take out our cameras. The scenery was really worth capturing. 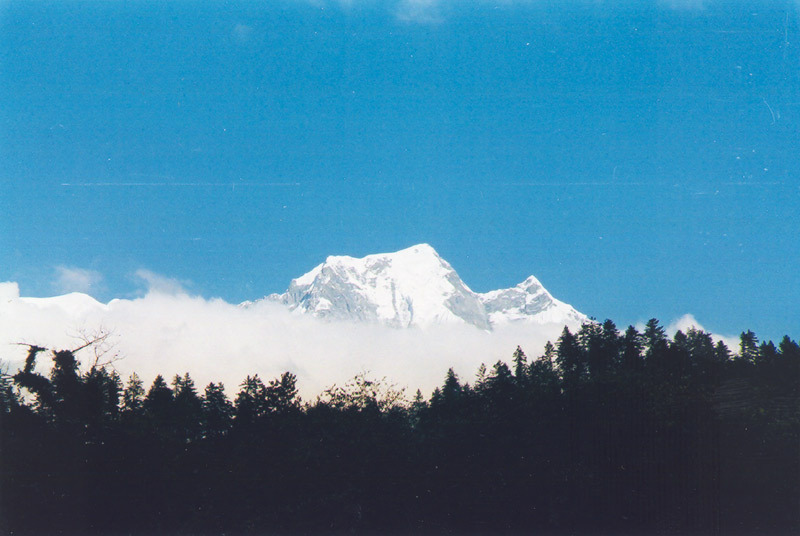 The snow-white peak of Dhaulagiri was looking at us from behind the clouds. The picture looked classical, we couldn’t stop shooting it. On the following day the landscape started to get subtropical sketches more and more. In my imagination the region looked more like South America, Columbia for example. And as it found out it wasn’t in vain. Everybody sells hashish here. Starting from Kathmandu we heard drug-dealers whispering ‘hacis, hacis’. By the way in the mountains hashish was quite cheap, although it is rather popular product among tourists and natives. As Pasha said six-month supply cost $20. And every native was trying to palm it off. We had to bargain there. And we got it for peanuts. For two days our tent had been smothered with sweet smell of Columbia. In the region of Tatopani there was the threat to come across Maoists (everyone was talking about it), we were lack of meeting them. Though we had nothing to lose. Besides, I heard they don’t attack the Russians. Probably, out of solidarity. We set up the camp not far from Beni for the last time. The rest of food was eaten, the rest of hash was smoked over. I’ll never forget the feeling of lying on the ground with my hands clasped under my head looking in the starry sky. And you find yourself lying on a huge ball one of the million ones flying across the vast universe. Next morning we were in Beni, loaded with cracks and drinking water, and having got on a bus we left for Pokhara. Оригинал, а не копия! Компания Ваши Суши.